Fri., July 21, 2017, 5:43 p.m.
ARLINGTON, Texas – Clint Dempsey is back in his home state of Texas, one goal away from a national scoring record for the United States team that is one win from playing in another CONCACAF Gold Cup final. The Americans play a semifinal game Saturday night against Costa Rica in a stadium synonymous with American football – the home of the NFL’s Dallas Cowboys, the Cotton Bowl and where the first College Football Playoff championship game was played three seasons ago. That is only about 180 miles from Dempsey’s hometown of Nacogdoches. Dempsey, one goal from matching Landon Donovan’s American record of 57 national team goals, wasn’t part of soccer’s only Gold Cup games at the $1.2 billion AT&T Stadium. In a 2013 semifinal game there when the Americans were on the way to their fifth Gold Cup championship, they beat Honduras 3-1. Donovan scored twice in that game – his 55th and 56th goals for the national team – and assisted on the other goal. About two months later, Donovan scored his final goal in a World Cup qualifier win over Mexico. Within a week after Costa Rica beat the U.S. team 4-0 in World Cup qualifying last November, Jurgen Klinsmann was out as the U.S. coach and Bruce Arena was rehired to the position he had been fired from a decade earlier. Costa Rica coach Oscar Ramirez said Friday that Arena has seemingly had a positive impact on the U.S. team. “They look more relaxed in terms of what they’re doing on the field,” Ramirez said through an interpreter. This U.S. roster for the Gold Cup knockout rounds also is much different than the one that played in Costa Rica eight months ago – not just the change at coach. Only five players from that game that are set for this semifinal game – Michael Bradley, Jozy Altidore, Matt Besler, Omar Gonzalez and Graham Zusi. Altidore, Dempsey, Bradley, Darlington Nagbe, and goalkeeper Tim Howard were all added to the lineup before a 2-0 win over El Salvador in the quarterfinal on Wednesday night in Philadelphia. 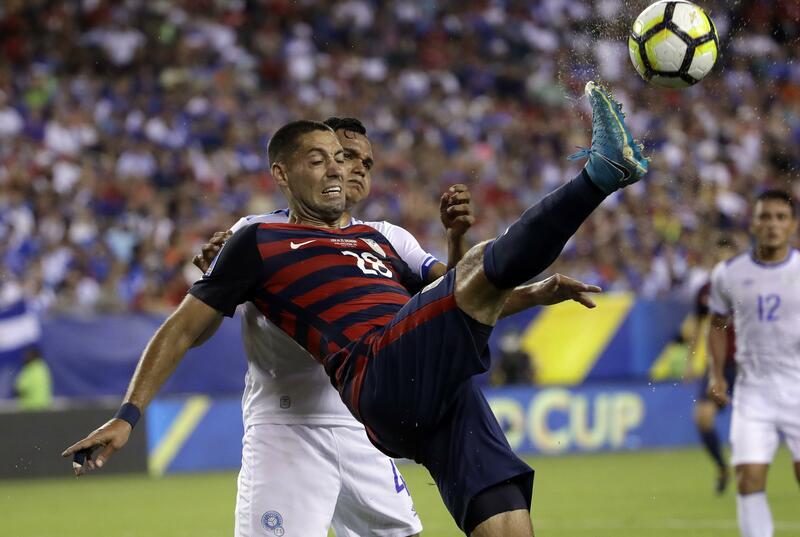 Dempsey set up Eric Lichaj’s goal in extra time before halftime to make it 2-0 against El Salvador. Dempsey also fed Gyasi Zardes for a breakaway, though that apparent goal didn’t count after he was ruled offside. That game was Dempsey’s 135th appearance for the national team, trailing only Cobi Jones (164) and Landon Donovan (157) on the U.S. list. Dempsey isn’t the only player with Texas ties with the U.S. team. Three players from FC Dallas, the MLS team that plays its home games about 40 miles away from the big stadium in Frisco, are on the roster: Kellyn Acosta, Matt Hedges and Jesse Gonzalez. Acosta, the homegrown midfielder who turns 22 next week, was recently named to the MLS All-Star team. He was born in nearby Plano, Texas, and signed by FC Dallas five years ago. Notes: Costa Rica is trying to get to its first Gold Cup final since 2002, when it lost 2-0 to the Americans. “Obviously, we want to look for that reward, that happiness, and go after that,” Ramirez said. “We have a difficult team in front of us.” … The United States’ nine goals are the most in this Gold Cup, while Costa Rica has allowed only one in its four games. Published: July 21, 2017, 5:43 p.m.